A non-binding MOU is a general statement of mutual interest to explore opportunities for collaboration, and does not include commitment of university funds, staff, space, facilities, or other university resources. These MOUs can be considered "hand-shake" agreements that often lay the foundation for future partnership, and are not official agreements of the University. GEO supports campus by facilitating and vetting international MOUs. UC Berkeley academic unit (School, College, Department, Organized Research Unit, etc.) should contact relevant counterpart at the foreign institution to ascertain mutual interest in establishing an MOU. 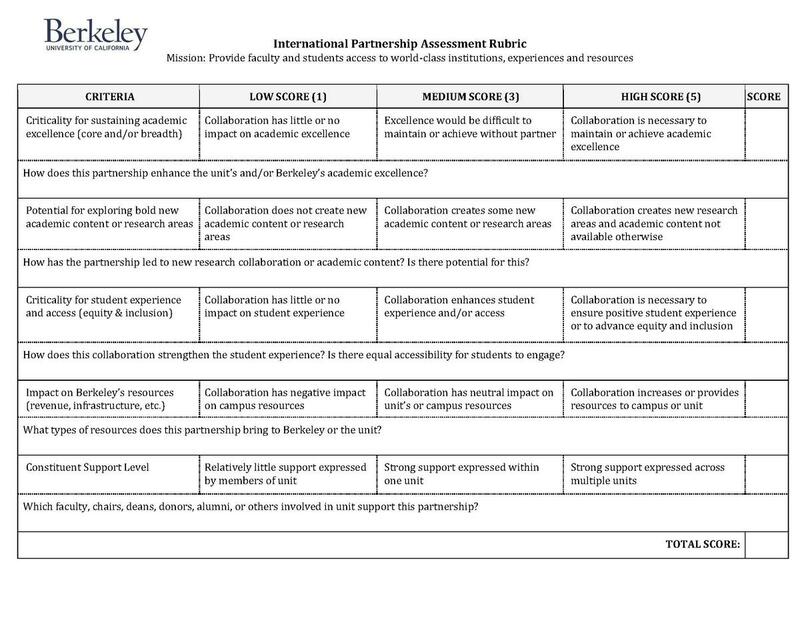 Units should consider UC Berkeley's Guiding Principles for International Engagement to ensure that international partnerships are aligned with the university’s mission. Unit should discuss tentative MOU with the Global Engagement Office (GEO) and check the international partner list to ensure an MOU with the institution does not already exist. All potential new international MOUs must be vetted by the Global Engagement Office to ensure UC Berkeley follows federal regulations related to working with international entities. Unit should ensure the relevant Dean (for academic units) or Vice Chancellor for Research (for research units) is aware of the potential MOU and supports the partnership. Unit should download the appropriate template (see sidebar), edit with relevant information, and send to the foreign institution for review. Non-binding MOU template should be used for general agreements. Research non-binding MOU template should be used when more specific details of a project have been brainstormed but there are still no binding terms or commitments. Following review by the foreign institution, unit should send draft MOU to GEO to ensure language meets UCOP policy governing international agreements. Should the need arise, GEO can work directly with the partner abroad to find mutually satisfactory language for the MOU. MOUs are non-binding and should not include a commitment of Berkeley resources, and must include an expiration date and the ability to terminate. Language related to intellectual property, dispute, and other binding language should not be included. Once the MOU is finalized by the unit and the international partner, GEO will send the document to be reviewed by the Senior International Officer (SIO) and signed by UC Berkeley Chancellor. The UC Berkeley Chancellor and Senior International Officer (SIO) are the only authorized signers for non-binding international MOUs. GEO will send a copy of the signed document to the campus unit and international partner. Please notify GEO in advance if multiple hardcopies are requested. All MOUs shall be archived and recorded with the Global Engagement Office to ensure appropriate compliance related to Export Control and Risk. Should the need to terminate an MOU arise, GEO will contact the unit to discuss the process. GEO will record active MOUs in the international partner list and will inform unit when it is time to renew the agreement. In order to ensure consistency of the terms, English is the preferred language for all campuswide MOUs. When translations are requested by the international partner, a second document should be developed. GEO does not facilitate MOU translation. Our MOU templates are pre-approved by Office of General Counsel and do not require additional review should no changes be made. If no language changes are made, we can immediately begin processing the MOU for signing. Once an MOU is final, the SIO's review and the Chancellor's signing take approximately two weeks, depending on their schedules. Faster turnaround may be possible under certain circumstances. MOUs with language revisions will need to undergo review by necessary campus units and will take significantly longer to process. Some international institutions may also require these documents be reviewed by their legal teams or translated, and therefore take more time to review and approve. We recommend you begin working with GEO on the MOU as soon as possible to ensure it be processed in a timely manner and meet any deadlines you may have.